How privacy app Keepsafe used analytics to find the right pricing plan. How much would you pay to keep this from happening? That’s one of the questions Zouhair Belkoura had to answer when pricing the premium version of KeepSafe, an app that helps you keep your personal photos and files private. Pricing for mobile applications is a tricky question, because of course everyone prefers “free.” But with KeepSafe managing billions of photos, a free app would result in the company hemorrhaging money. Since KeepSafe is an Amplitude customer, they were happy to walk us through how they used analytics in the process of figuring out how to monetize their application. What is the Keepsafe app? The Keepsafe mobile app is a digital vault for your mobile device. It allows you to save and sort photos and documents behind a locked pin, granting you easy access to your personal files, while protecting your privacy from others. Many people keep photos of ID and other documents in Keepsafe in case of loss or emergency. One album can be for private personal photographs, and another can be work documents and notes that shouldn’t be seen outside the company. A few years ago, KeepSafe was just an idea. Today, KeepSafe has over 35 million global users, 10 million of whom use the application at least once a month. As their product grew, and costs rose, Zouhair and his team were faced with a common but critical question - how was KeepSafe going to make money? KeepSafe officially incorporated in January 2012. They started growing much faster than they expected to, and they were thrilled. The vast majority of their growth was organic: customers really valued the product and were referring their friends. With an early team of only 3, KeepSafe managed to attract 10 million users. They raised a $3.4 million Series A by July 2013. This rapid growth lead to a small hurdle: KeepSafe had been using Google Analytics to monitor their user behavior. When they exceeded the limit on hits per month for the free service, Google upgraded them to premium, serving them a price tag of $150K for the year – for the exact same product they’d been using for free. KeepSafe decided it was time to switch analytics providers, so they began searching for a solution that could provide the insights they needed and also handle their growing event volumes. They ended up switching to Amplitude, with the main driving factors being the full access to their raw data via Amazon Redshift and the cost-effective pricing per data point. They happened to make this switch just as it was becoming clear that KeepSafe users were expecting a service, not just an app. They wanted a way to keep their files and photos across multiple devices, and when they got new phones, they expected their KeepSafe files to still be there when they downloaded the app. Essentially, users wanted cloud storage, which Zouhair and the team knew they would have to charge for. KeepSafe started planning its transition into a freemium service. The first thing to do was decide on features to include in the premium plan. The team started with features that users had asked for, and with which they thought could add a lot of value to KeepSafe. Mobile cloud storage services already existed, but didn’t have KeepSafe’s standards of privacy and control. In addition to cloud storage, the Premium service was to include: break-in alerts, PINs individualized to albums, and a skin disguising the KeepSafe app as a virus scanner. KeepSafe tested a few different payment models on a small percentage of their new users, and found that an automatic free trial method resulted in the highest conversion rates. It worked like this: anyone who downloaded the app got an automatic free 30 day trial of the Premium plan. At the end of the trial period, a pop-up modal would appear informing the user that they could either subscribe to the Premium features on a monthly or yearly basis, or downgrade to the free plan to continue using KeepSafe’s basic feature. KeepSafe measured the retention of users who went through the free trial and were then shown the paywall to check for any negative effects on long-term usage. There were no significant effects, so the KeepSafe team decided to stick with the automatic trial model and move on to the next step: pricing. To determine a price point, KeepSafe ran an A/B test on a few options. KeepSafe sorted users into three different experimental groups, and tracked them across devices, using an internal tool they developed called Sorting Hat (yes, named after the hat in Harry Potter that “sorts” new students into houses). Each group was shown a different pricing option at the end of their free trial period. KeepSafe tracked the experimental groups in Amplitude by tagging each customer with user properties that tied them to their group. By feeding data from the different experimental groups into Amplitude, KeepSafe was able to easily measure the differences in conversion for each group. Below is a funnel chart showing the progression of users from viewing the paywall at the end of the trial period (TRIAL_EXPERIMENT_MODAL_VIEW) to actually purchasing the premium plan (TRIAL_EXPERIMENT_CHECKOUT_BUY). Each color bar is a different experimental group. 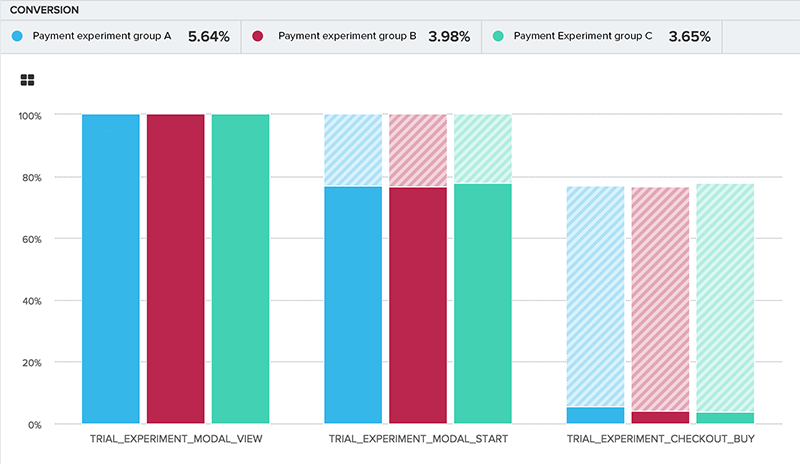 In the funnel graph, you can see the percentage of each group that moved on from one step to the next in the funnel, as well as the final conversion rate at the top. Using this data, KeepSafe looked for the price point that would maximize revenue. Of course it makes sense that the lowest price point would convert at the highest rate, but KeepSafe needed to optimize for (price)*(# of users converted). Think of it this way: 50 users willing to pay $50 each are worth 2.5 times as much as 100 users willing to pay $10 each. In this funnel graph, you can see the percentage of each group that moved on from one step to the next in the payment funnel. At the top, you can see the final conversion rate of each experimental group. Exact numbers and the names of the experimental groups have been changed. How much is Keepsafe premium? 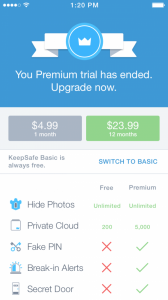 Keepsafe premium currently costs $4.99 per month. Customers also have the option to pay for annual pricing of $23.99. This saves Keepsafe customers who subscribe to a yearly plan a whopping 60% each month (equaling $3.00 each month!). Keepsafe fully rolled out their paid plan in late summer of 2014. 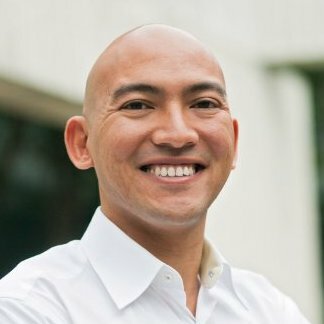 Keepsafe’s current pricing was based off their previous test results. Early on, they noticed an interesting trend in their data: they saw no difference in conversion rates to the paid plan between their iOS and Android users. This went against conventional wisdom and most data sources, which said that iOS apps make more money on a per user basis. In 2014, one report stated that iOS apps rake in 85% more revenue than Android apps, despite Android’s commanding lead in market share. iOS (left) vs. Android (right) conversion rates to KeepSafe’s paid Premium plan. Although most apps see much higher revenue per user for iOS than Android, KeepSafe has seen fairly equal conversion rate to their paid plans on both platforms. It’s unclear why KeepSafe skews from the norm. Perhaps they offer something so universally useful, that Android and iPhone users alike are willing to pay up for the extra storage and improved features. What actions correlate with conversion? KeepSafe also wanted to know what actions in their app might contribute to higher conversion rates to the premium plan. Using behavioral cohorting, the team defined groups of users based on factors like total number of pictures stored and number of times the app was launched. By comparing the conversion rates between different behavioral cohorts, KeepSafe found that the number of app launches is the metric most correlated with conversion rate. Users who launch the app 10-25 time have a higher chance of converting than users who launch less than 10 times. Interestingly, the number of pictures stored doesn’t seem to have any correlation with conversion rates after the trial period. We hope learning about KeepSafe’s data-driven approach to pricing strategy is helpful if you’re thinking about implementing pricing or freemium for your own app! Now that KeepSafe has figured out pricing, their next steps are using this same approach to test features and optimize their app for the best user experience possible. They’ve come a long way since the early days as a side project, and now have a team of 10 working out of an office in the SOMA neighborhood of San Francisco. We’re excited to see what they do next in their mission to make digital privacy as easy as closing a door. Special thanks to Zouhair Belkoura, CEO and co-founder of KeepSafe, for taking the time to share his pricing process with us and walk us through the results!